I recently did an experiment to find the magnetoresistance of one of the RX-102-BR chips, in fields up to around 14 T. What happened was that as the field is ramping, the voltage across the chip (measured with a lock-in-amp) decreased, as expected, but once a field value had been reached, and stabilised, then the relaxation of the chip back to the temperature of the bath is of the order of 10 mins, rather than 20 s. This is true for a bath temperature of around 30-80 mK, but above 100 mK everything is as expected. The electrical connections are 4 silver-epoxied NbTi wire, coiled, satisfying the 4-probe measurement requirement to neglect contact resistance and other. 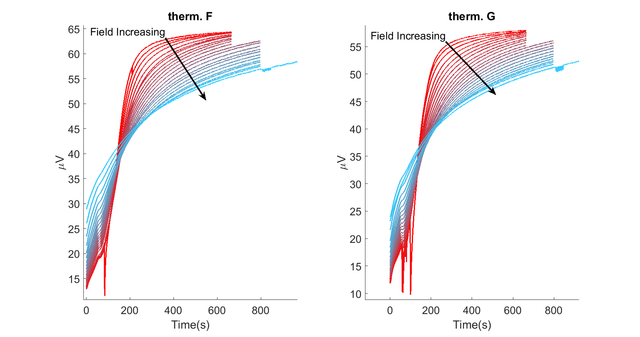 Attached are images showing the relaxation times for a variety of field values of 0-14 T, at 50 mK base temperature. Are these relaxation times expected for such a set-up? If not, any ideas what could be slowing down the cooling of the chip? I have just a couple of quick questions to help answer your question. First, you mention that "... then the relaxation of the chip back ot the temperature of the bath ..." - is the chip mounted directly directly in the He3-He4 mix in the mixing chamber? If not, is the chip mounted externally against the mixing chamber in vacuum? If mounted externally in vacuum, how is the chip heat sunk against the mixing chamber? The bare chip would need an insulating layer to keep it from shorting out when mounted against any metal part of the DR cryostat, and I would expect very little heat flow / thermal connection through the superconducting NbTi lead attachments at those temperatures. Is it possible that the chip isn't we'll heat sunk and your seeing the long thermal response as a result of limited heat flow through the superconducting leads? The chip is electrically insulated from the body of the fridge - mounted upon a layer of gold-kaptanTape-gold. These are all firmly pressed and silver-epoxied to one another, and the chip was clamped down to a copper probe firmly. This copper probe is firmly clamped to the MC, and all the electrical wiring is twisted and heat-sunk to the body of the probe. Thus, I have little suspicions that the chip is not well coupled to the MC of the dilution fridge. The chip and NbTi coils were mounted about 3-4 mm away from the field centre, so if the critical field of this particular coil (California Fine Wire company, who don't exist anymore I think?) is around 13 T, then once I'm above 13 T, then I'd expect some significant difference in the readings...but I see no sudden jumps in the voltage, probably due to the fact that it's a four-probe measurement. But the coils going normal made me think that their thermal insulation is bad. I not aware of any other affect that would cause the slow thermal relaxation. It sounds like the chip should be well heat sunk, but I do wonder if something is going on with the leads. I agree that you wouldn't see sudden jumps in the voltage when the superconducting leads go normal due to the four lead measurement. If there is a convenient way to do so it may give a clue to what's happening by measuring the devices in a 2-lead measurement scheme. In the best case, the conversion from 4-lead to 2-lead would be done near the mixing chamber (cold plate or still?). In this scenario, you might be able to correlate the change in relaxation behavior in going from the 30-80 mK region to the above-100 mK region with a change in the behavior of the superconducting leads. Also, what other thermometer are you measuring the time response against?